BCDN Staff Giants or Royals? 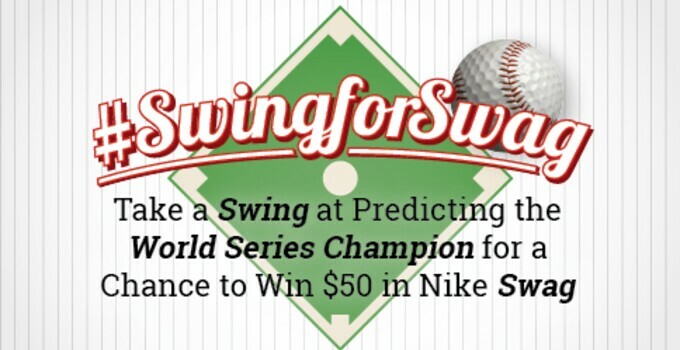 Take a #SwingforSwag at who will be the champ & win! Giants or Royals? Take a #SwingforSwag at who will be the champ & win! Best of Seven. The 2014 World Series is down to the San Francisco Giants and the Kansas City Royals, who will take baseball’s Fall Classic? Even if baseball isn’t your sport, paying it some attention before the last pitch could land you a $50 Nike gift card. The idea is simple: Head over to the Billy Casper Golf Facebook or Twitter pages, make sure you like and/or follow us, then tell us who you think will win the World Series using the hashtag #SwingforSwag and you’ll be entered to win a $50 Nike gift card. You have nothing to lose and everything to gain as the winner is selected at random! Take a #SwingforSwag by predicting the World Series Champions for a chance to win. For full contest rules, please click this link.